Thanks also to Sam Cooper of Global and all others in media who are now covering this issue. • READ SANDY GAROSSINO’S ARTICLE, WHICH INCLUDES A CALL TO ATTORNEY-GENERAL DAVID EBY TO CALL FOR A CHARBONNEAU-STYLE PUBLIC INQUIRY, HERE. • READ LAILA YUILE’S POST ON BC CORRUPTION HERE. BC NEEDS A PUBLIC INQUIRY NOW. the german report is not enough. Today the BC government released its report on a major audit of the BC Lottery Corporation. Councillor Adriane Carr’s casino motion B4 passes unanimously in Vancouver City Council! Permalink to this post is here. After the debate some further amendments were made by the mayor and Vision-dominated council but we all considered them friendly amendments. The motion passed unanimously. We would like to thank each and every councillor for their vote. Everyone did the right thing; huge thanks to all. [Update: Adriane’s motion got a seconder – George Affleck. This means the motion will be presented tomorrow, Wednesday, sometime before noon most likely. The committee meeting starts at 9:30 and Adriane’s motion is 4th on the list. But we’ll update you regularly! Please plan on coming! WE NEED YOU TO COME TO COUNCIL AND SPEAK TO THIS MOTION ON WEDNESDAY MORNING at 9:30. Information from City Hall: “Motion B4 (Restricting Expansion of Gambling and Involvement of Michael Graydon in Edgewater Casino) … is on the agenda for the Regular Council meeting on Tuesday, July 22, 2014. Please note that we do not know when the motion will be heard – it could be at any time after 9:30, but will likely happen in the morning.We will be updating you on all developments on both our Facebook and Twitter accounts. FOR IMMEDIATE RELEASE: Vancouver, July 11, 2014: Following the report of the BC government’s internal auditor, Vancouver Not Vegas renews its February 13th call for the Gaming Policy and Enforcement Branch (GPEB) to block PV Hospitality (a Paragon Gaming-related company) from employing Michael Graydon. Vancouver Not Vegas calls for the Gaming Policy and Enforcement Branch (GPEB) to refuse to recognize Michael Graydon as a qualified officer of the newly formed PV Hospitality ULC, due to the public perception that Mr. Graydon may have violated the Conflict of Interest Guidelines of the BC Lottery Corporation, and due to his possession of sensitive confidential information pertaining to Paragon’s competitors. 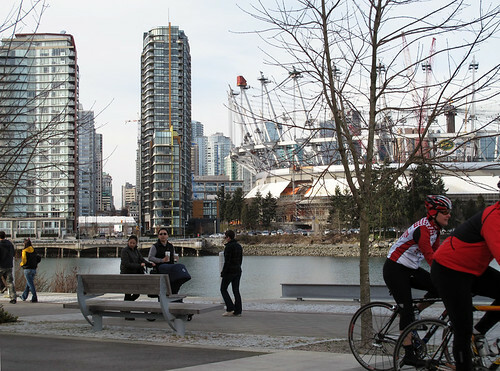 Further, Vancouver Not Vegas calls for the City of Vancouver to attach a restrictive covenant to the property’s Development Permit, permanently limiting the number of slots and gaming tables on the new Edgewater Casino site. Finally, VNV calls for the BC Lottery Corporation to publicly disclose all financial projections and public subsidies associated with the proposed Edgewater Casino expansion at BC Place. According to previous financial projections associated with an expanded Edgewater Casino, the BC Lottery Corporation was scheduled to transfer $16.9 million annually to Paragon Gaming to off-set construction costs. PavCo has re-negotiated a 50% lease reduction to $3 million annually. No projections of increased revenues (net of revenue losses to other local casinos) to the BCLC have been made public. Link to this release as a blog post is here. Thanks to all who came to City Hall yesterday. We will update you soon on the events of yesterday, but in short the Development Permit Board passed the massive casino – double the square footage of the current one, and far more space per slot machine than in any casino in North America, which seems to signal later expansion – saying that it was not within their jusrisdiction to refuse the rezoning for that size that the Vision-dominated Council passed in December of 2011, a week after the last civic election. However the DPB did stipulate that Public Health Officers must be consulted with respect to harm reduction measures, as per the recent BC government Kendall Report which detailed a rapid rise in gambling addiction in BC. The institution of harm reduction measures, which might include limiting the casino to regular bar hours, is a glimmer of hope. Stay tuned for news on this angle. 1. If there is to be no gambling expansion, why does the new building contain DOUBLE the gambling floor space of the current Edgewater Casino? 2. Why have Vancouver City Hall and the BC government not responded to the recent gov’t report by Perry Kendall, BC’s Chief Medical Officer, that details a massive spike in gambling addiction in the five year period of rapid gambling expansion in BC, 2002-2007? Why is Vancouver not considering harm reduction measures for the new casino, including limiting the casino to bar hours, or limiting gambling space so that the BC gov’t can’t force more slots on Vancouver later? Why is Vancouver the only major Canadian city putting a casino in a dense downtown residential area? Our most recent press release is here. UPDATE: You can still sign our petition, even though the Development Permit Board refused to send the application back to City Council for further discussion. Register your opinion that City Council and Vision Vancouver must institute significant harm reduction before this casino can go ahead. For a permalink to this post, click here. On December 16, 2013, the City of Vancouver’s Development Permit Board (DPB) will review a development permit application for a new Edgewater Casino at BC Place. On December 16, the proposed Edgewater Casino goes to the Development Permit Board for approval. If it passes there, construction can commence before Christmas. Perry Kendall, BC’s Chief Medical Officer, published a report on October 17, 2013 showing that gambling addiction has doubled in BC over the past 5 years. Gambling addiction is one of the most hidden and deadly of addictions, affecting whole families and communities and costing the BC health and other public systems. There has yet to a reaction from the BC government or the City of Vancouver to this report. This is a serious public health issue. Why has there been no gov’t reaction to this damning government report? Please read our statement regarding Paragon’s announcement of plans to build a $535m “Casino Resort” at BC Place Stadium. And please share on Twitter and Facebook. Thank you! Links to these are above. Link to this media release is here. It may have appeared that we defeated the mega-casino back in April 2011, but it’s not completely over. Vision Vancouver passed a rezoning in November 2011 allowing PavCo and Paragon to build a 2.6 acre casino for its existing 600+ slots. Why? We’re watching the BC Place and casino situations closely. 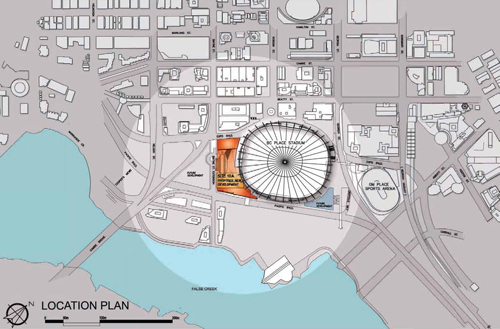 Over summer and fall 2012 PavCo and BCLC held meetings (the subject of which remains undisclosed despite FOI requests), and in April 2013 the BC government announced a deal with Paragon for a smaller casino at BC Place, while the NDP have floated the idea of selling BC Place. What’s up? Stay tuned. 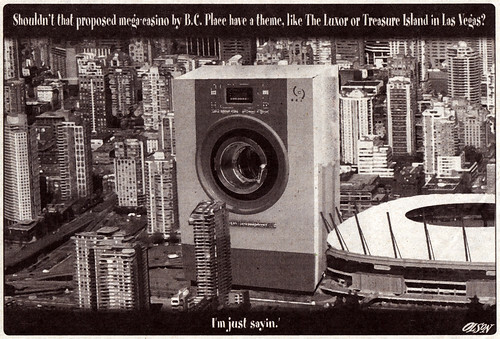 PLEASE READ OUR REPORT CONTAINING OUR ONGOING OBJECTIONS TO THE CASINO AT BC PLACE. Our report includes arguments from the perspective of public health and addiction, urban planning, polling & public opinion, financial & economic development considerations, and more. It also contains our long list of endorsers. Surrey’s citizens led by a group called No Casino in South Surrey worked hard to oppose a new resort casino, and on Jan. 18, Surrey City Council voted against a casino 5-4 with Mayor Diane Watts casting the deciding vote against. 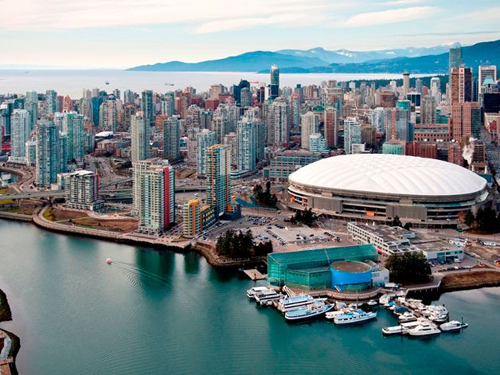 The two largest cities in B.C, Vancouver and Surrey, have now said no to new and expanded casinos. Let’s hope this sends a message to other municipalities in BC and beyond. More on the Surrey story here. Visit the Surrey group’s website, Twitter and Facebook. Toronto citizens successfully fought a mega-casino proposed by OLG (equivalent to our BC Lottery Corp) and corruption-ridden MGM Casinos. The final decision was made at Toronto City Hall in June 2013. Congratulations to No Casino Toronto for their win after a lot of hard work. 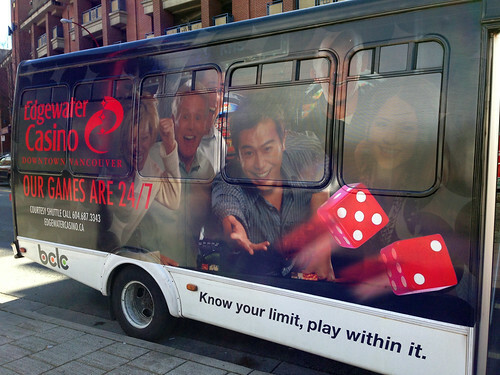 Visit No Casino Toronto’s website, Twitter and Facebook page. We won! Thanks to the thousands of Vancouverites who helped us defeat the mega-casino. This is not a game. A good faith public consultation process lies at the heart of all gambling expansion applications in the province. It dishonours the people of British Columbia when Crown corporations try to game the public in such a cynical way. See our media release here. Most Vancouverites don’t like gambling or gambling expansion. A majority of Vancouverites strongly opposed the casino plan, just as they opposed a similar plan (also spearheaded by David Podmore) in 1996. Over two decades, the proportion of Vancouverites who oppose gambling expansion has never really changed. Even when pollsters ask leading questions in polls paid for by casino proponents, those who oppose expansion significantly outnumber those in favour. We defeated a mega-casino in the 90s, we defeated this casino in 2011, and it’s fair to predict that any future casino plans will be defeated too. To read about the first 3 nights of casino hearings, click here. Above: a “before” photo, without casino (and before stadium roof was removed). Below: proposed casino location and design. In the drawing above, the white building at the right indicates the condo hi-rise you see in the photo below (with vertical yellow stripe). sculpture at Terry Fox Plaza. Below, video showing Min. Pat Bell claiming that PavCo has dealt with the problem and conferred with the City, neither of which is true. I am Hoping And Praying For The Vancouver Not Vegas Coalition That They Can Eliminate And Destroy This Forever For This City. Every year I see more and more students whose lives are being destroyed by their parents’ addiction to gambling. The “know your limits, stay within in it” adds do not touch how addictive gambling can be. Some brains simply get hooked on the pleasure of the one big win. And I do say one…..